Dimensions 0.70 by 5.50 by 8.50 in. With growing academic responsibilities, family commitments, and inboxes, scholars are struggling to fulfill their writing goals. A finished bookâor even steady journal articlesâmay seem like an impossible dream. But, as Joli Jensen proves, it really is possible to write happily and productively in academe. Jensen begins by busting the myth that universities are supportive writing environments. She points out that academia, an arena dedicated to scholarship, offers pressures that actually prevent scholarly writing. She shows how to acknowledge these less-than-ideal conditions, and how to keep these circumstances from draining writing time and energy. Jensen introduces tools and techniques that encourage frequent, low-stress writing. She points out common ways writers stall and offers workarounds that maintain productivity. Her focus is not on content, but on how to overcome whatever stands in the way of academic writing. 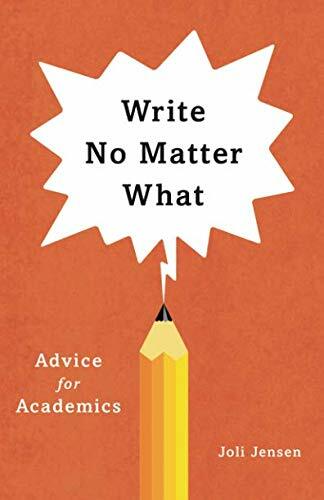 Write No Matter What draws on popular and scholarly insights into the writing process and stems from Jensenâs experience designing and directing a faculty writing program. With more than three decades as an academic writer, Jensen knows what really helps and hinders the scholarly writing process for scholars in the humanities, social sciences,and sciences. Cut down the academic sword of Damocles, Jensen advises. Learn how to write often and effectively, without pressure or shame. With her encouragement, writers of all levels will find ways to create the writing support they need and deserve.